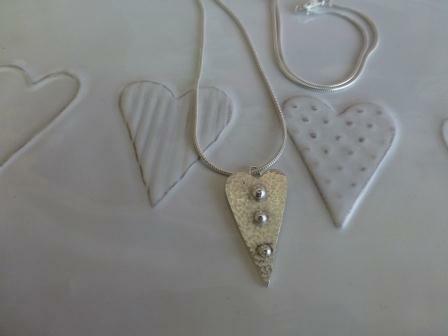 A shiny, single elongated hammered heart with 3 silver nuggets. The nuggets are formed by the granulation process, which involves heating silver until it forms spheres. The pendant is approximately 1.5cms wide and 2.2cms long. The necklace is presented with a 20 inch silver snake chain.